For years, the month of February has been the kick-off of the Coca-Cola Company’s sponsorship of the National Heart Lung and Blood Institute’s (NHLBI) Heart Truth campaign. Heart Truth began in 2002, with the goal of raising awareness that heart disease is the number one killer of women. The campaign fits within the general mission of NHLBI to collaborate with a range of stakeholders to promote the prevention and treatment of heart, lung, and blood diseases. As part of the Department of Health and Human Services (HHS), NHLBI provides research funding and conducts outreach with the public to improve the public health. As a federal agency, NHLBI is subject to legal limits on its use of funds and HHS’s ethical guidelines for co-sponsorship of events. These guidelines are meant to guard against conflicts of interest that would undermine the primary mission of NHLBI. Coke’s corporate funding disclosures in the Fall of 2015 indicate that as public pressure on NHLBI built, Coke shifted the bulk of its heart health giving to a tight circle of non-governmental heart health organizations consisting of the American College of Cardiology, the Preventive Cardiovascular Nurses Association, the American Dietetic Association, and Brigham and Women’s Hospital in Boston, MA. From 2008 to 2014, The Coca-Cola Company, under its Diet Coke brand, was the Heart Truth campaign’s most visible co-sponsor: Despite the fact that HHS’s ethical guidelines place a particular emphasis on avoiding the appearance of product endorsement, Heart Truth logos were printed on billions of Diet Coke cans, heart health-themed Diet Coke ads ran during the Olympic Games, Coke enlisted high-profile celebrities like Heidi Klum to appear at Heart Truth events, and Diet Coke beverages were distributed at community heart health screenings. NHLBI’s partnership with Coke drew ire from the public health community because it seemed untenable to partner with a company that also sells sugary drinks linked to obesity and heart disease. The fact that the partnership focused on Diet Coke was particularly problematic because it closely followed the release of the NHBLI-funded Framingham Heart Study’s findings that consumption of diet soft drinks appeared to be linked to increased risk factors for heart disease. In 2010, the Center for Science in the Public Interest (“CSPI”) called on the government agency to sever its ties with Coke, but NHLBI publicly refused to do so. The primary rationale NHLBI gave for keeping Coke as a corporate sponsor was that the company allowed the agency to extend its reach to get out the message that heart disease is an important health concern for women. CSPI’s challenge to the program led to a public debate about the role of Coke in NHLBI’s educational activities. At the time, the dollar amounts in these contracts were redacted as proprietary information. The breadth of the rights granted to Coca-Cola is in keeping with a typical private arrangement for event sponsorship, but seems startling in the context of a government run educational campaign. 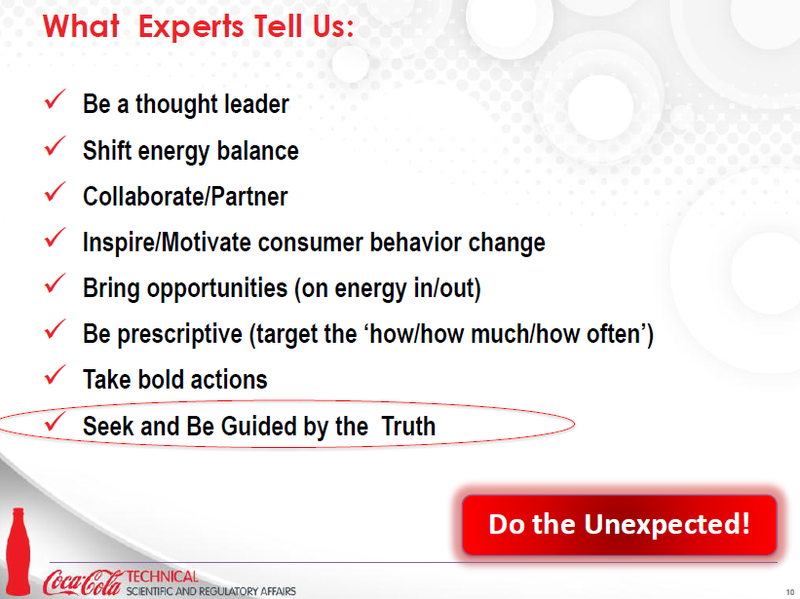 Ogilvy Public Relations Worldwide was awarded multi-year government contracts from the NHLBI totaling $11.9 million to execute the Heart Truth campaign on its behalf. 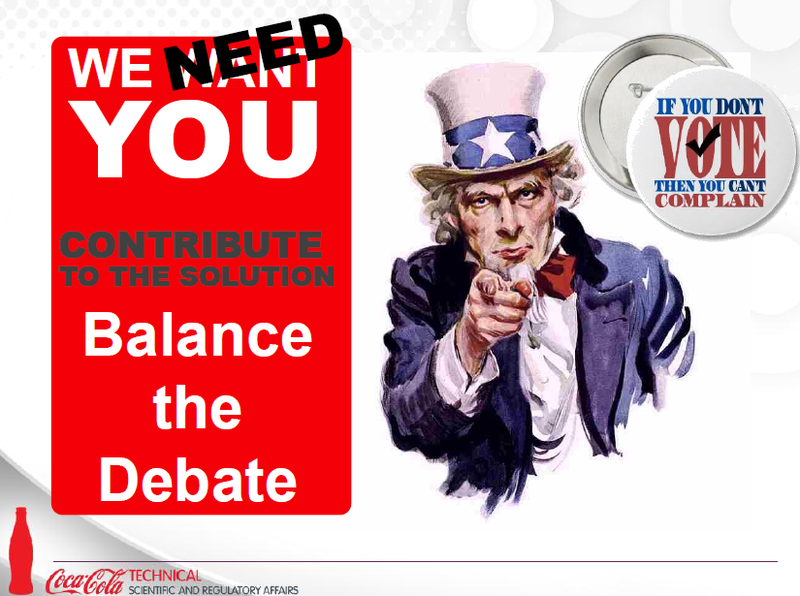 Organizers of complex, national educational campaigns must work with sponsors to ensure events run smoothly. The contracts Ogilvy entered into on NHLBI’s behalf with Coke, however, reveal a situation where it appears that NHLBI was granting Coke rights to advance the company’s commercial agenda. In March of 2010, PHAI wrote a detailed letter to the Associate General Counsel for Health and Human Services (HHS), asking that it review NHLBI’s relationship with Coke pursuant to the agency’s written ethical guidelines for co-sponsorships of events. In its reply, HHS cited a general provision of the Public Health Service Act granting NHLBI the authority to conduct health promotion campaigns and deferred decision-making about the appropriateness of Coke’s co-sponsorship of the Heart Truth campaign to NHBLI. 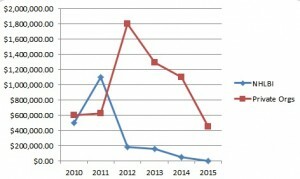 Despite NHLBI’s public defense of Coke in response to CSPI’s letter and apparent agency inaction after PHAI’s request to review the relationship, after 2011 Coca-Cola shifted its support for Heart Truth and other heart health activities sharply away from the NHLBI. According to Coke’s initial funding disclosures in the Fall of 2015, between 2010 and 2015, Coke’s total funding of heart health-related organizations and educational activities was approximately $8 million (click here for a detailed description). $7.8 million of these funds went to just five organizations: NHLBI (via Ogilvy and the Foundation for the National Institutes of Health), the American College of Cardiology, the Preventive Cardiovascular Nurses Association, the American Dietetic Association, and Brigham and Women’s Hospital in Boston, MA. 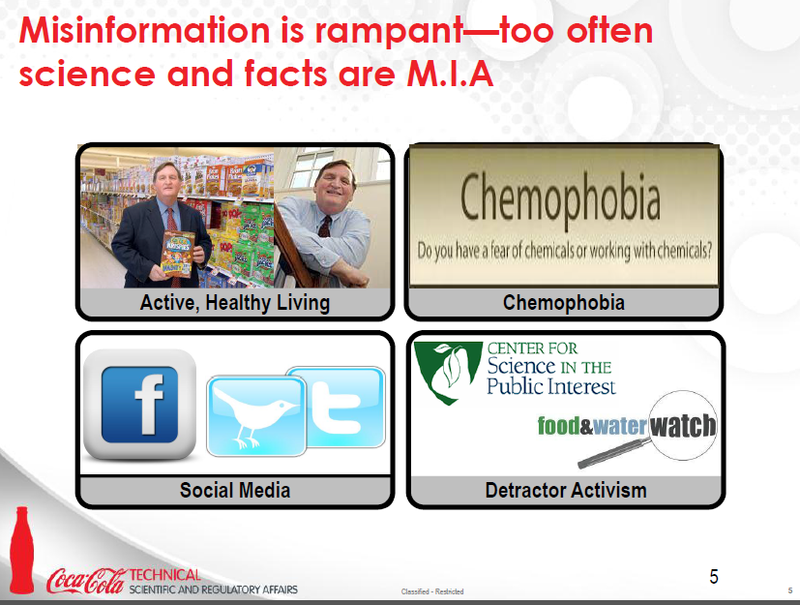 NHLBI-related funding of the Heart Truth totaled $1.9 million with Coke’s contributions peaking at $1 mil in 2011. Starting in 2012, Coke sharply reduced its direct NHLBI support and shifted its gifts to private organizations not subject to FOIA requests. Coke’s Heart Truth partnership with NHLBI was created under the leadership of then NHLBI Director Elizabeth (Betsy) Nabel, MD. Dr. Nabel is a cardiologist who left public service in 2010 to become President of Brigham and Women’s Hospital (BWH) in Boston, MA. 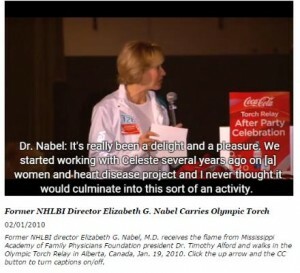 Dr. Nabel traveled to Canada to be an official 2010 Olympic Games Torchbearer for Coke and spoke glowingly about her relationship with Coke. In 2013 and 2014, Dr. Nabel and Dr. Foody leveraged their relationship with Coke into $1.2 million dollars of funding for a BWH cardiovascular health initiative called ClimbCorps to promote stair climbing for heart health and provide heart health education. Dr. Foody served as the ClimbCorps’ Medical Director. In 2013, Coca-Cola executive Helen Tarleton personally attended a ClimbCorps event with Dr. Nabel and Dr. Foody. 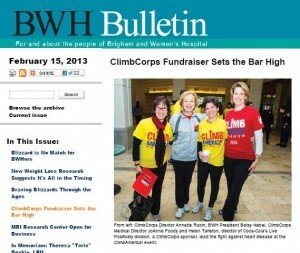 The program no longer has an active website and all links to ClimbCorps redirect to the BWH general website. The program’s emphasis on physical activity fit well within Coke’s overall obesity strategy to focus on physical activity as opposed to diet. In the process, millions of dollars were spent in ways that Coke itself now admits were not adequately transparent, and were inappropriate given the company’s overwhelming commercial interests in the health issues addressed. There is no question that funds are desperately needed for programs to address crucial diet-related public health issues like cardiovascular disease in women. Coke spent $8 million on heart health education in five years (not including the in-kind contributions it made via specially printed product packages, Heart Truth dedicated websites and television commercials), while the federal government spent just $17 million on the Heart Truth campaign over ten years. The problem with Coke’s heart health spending is that its primary goal has been to downplay the role of sugary drinks in the obesity epidemic and to position diet beverages as healthy alternatives. Neither of these positions is fully supported by actual evidence and, as such, are in conflict with the mission of truly unbiased cardiovascular health initiatives. There remain many unanswered questions about Coke’s heart health “partnerships.” To what extent did Coke’s initial participation with NHBLI’s Heart Truth campaign give the company legitimacy through what appeared to have been the government’s imprimatur and grant it access to the private organizations it subsequently partnered with? What other requests for political support did the company make of the heart health organizations it funded? How did Coke’s funding impact the heart health activities of the organizations it funded in terms of dietary recommendations to the public or support for public health policies at odds with Coke’s agenda? The most important question left in the wake of Coke’s co-optation of the Heart Truth campaign is this: Moving forward, how can the United States create and sustain unbiased funding mechanisms for the crucial public health issues of our time? 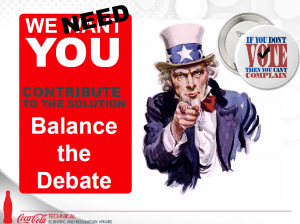 Coke’s funding of GEBN is part of a well-articulated company strategy it calls “Balancing the Debate.” Coca-Cola’s chief scientific officer, Rhona S. Applebaum , PhD, laid out the Balancing the Debate strategy at a 2012 conference for the sugar industry. 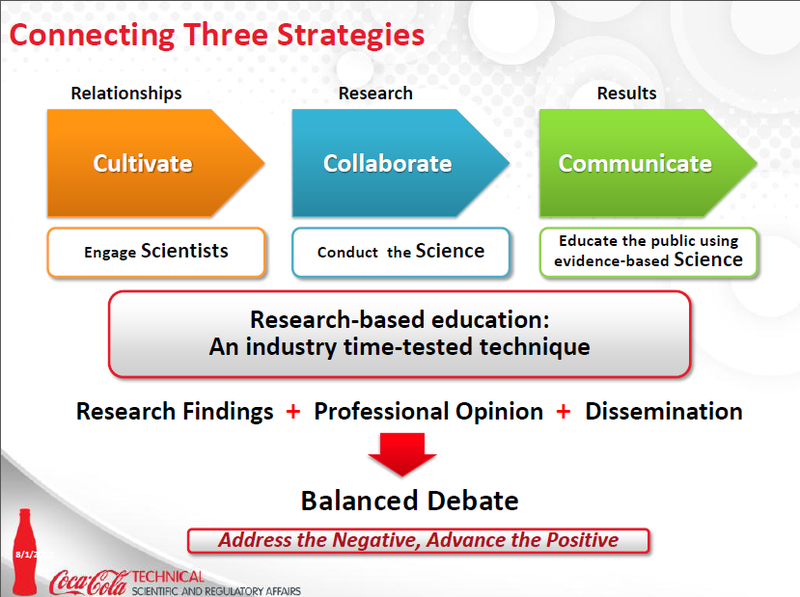 (CLICK HERE FOR THE FULL PRESENTATION) The strategy seeks to discredit what the company calls “detractors” in the scientific community like Kelly Brownell, Dean of the Sanford School of Public Policy at Duke University (formerly of Yale University), and public health organizations like Center for Science in the Public Interest. To that end, Ms. Applebaum, shared Coke’s strategy to “Balance the Debate” by using three interdependent steps: “Cultivate Relationships,” “Collaborate Research,” and “Communicate Results.” These steps, if properly taken, will result in a balanced debate that will “Address the Negative” and “Advance the Positive” for the food industry. 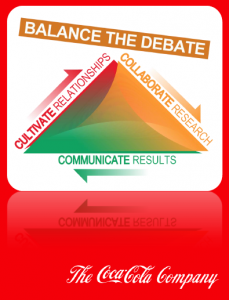 Ms. Applebaum, was clear that cultivating relationships and research collaborations comes down to dollars and cents. 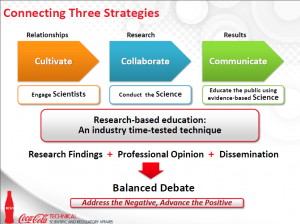 She outlined how to use research funding for “defensive and offensive science and research” to address the issues faced by the food industry. 8) require that academic researchers, when they work in contract research organizations or act as contract researchers, make clear statements of their affiliation; require that such researchers publish only under the auspices of the contract research organizations. (emphasis added). 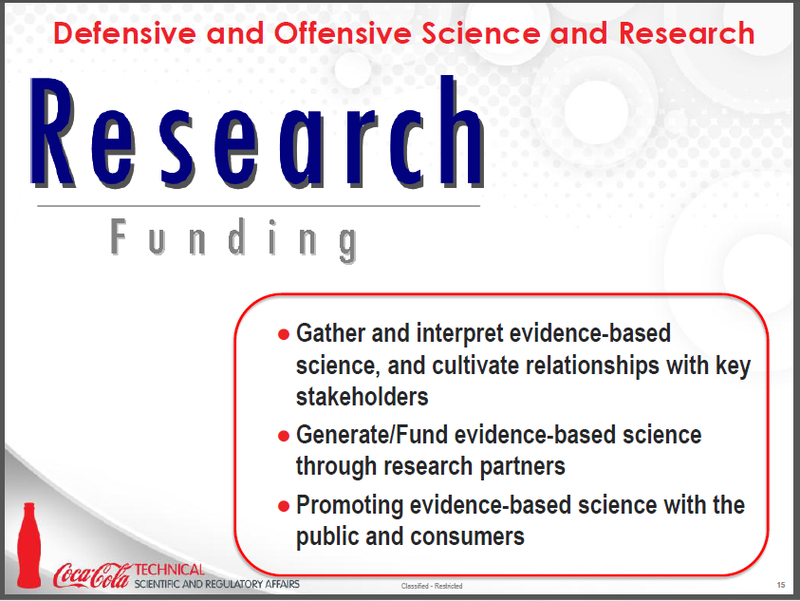 These guiding principles clearly were not adequately followed in the case of Coke’s funding of the GEBN, and it remains to be seen what other research it has been cultivating as part of its effort to “balance the debate.” Moreover, the whole concept of funding “defensive and offensive science and research” is completely at odds with the principles of objective research design contained in the guiding principles. 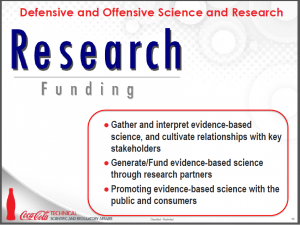 Coke has had a concerted effort to fund science in its favor pursuant to a specific plan laid out by its chief scientist in 2012, and it failed to adequately follow the ethical guidelines its chief scientist helped to write in 2009. The remedies CEO Kent now promises are to disclose who the company has funded (something, according to their chief scientist, the company should have already been doing), and enlisting more experts to help sort things out. For Coke’s CEO to say that the criticism of actions that were clearly in line with a well-articulated Coca-Cola Company strategic plan and failed to comply with basic ethical principles co-written by its chief scientific officer “does not reflect” the company’s “intent” or “values” is partly right and partly wrong. It clearly reflects Coke’s intent to fund science to serve its interests. 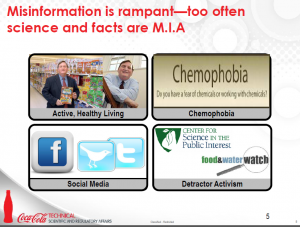 It does not, however, reflect the purported values of the company with respect to working with scientific researchers. At this point, the Supreme Court of NY County (March 11, 2013) and the Supreme Court, Appellate Division, First Dept. (today) have ruled that the sugary beverage serving size cap in New York is invalid. The case name is: In re New York Statewide Coalition of Hispanic Chambers of Commerce, et al. v. New York Dept. of Health and Mental Hygene, et al..
Clearly, I was mistaken in my prediction (see original post below) that the measure would survive a legal challenge. While the City will seek review by the Court of Appeals of the State of New York (the state’s highest court), this has clearly turned into an uphill battle for Mayor Bloomberg and the City at this point. Interestingly, the beverage industry has (so far) successfully relied on a case brought by the tobacco industry in the 1987 to successfully the stop the NY Health Council from taking steps to regulate smoking in public places. At that time, it was politically impossible to get the state legislature to enact smoking restrictions in public indoor areas and limit smoking in restaurants. Such a measure was viewed as an extreme infraction on smokers’ rights. In that case, Boreali v. Axelrod, the court held that for several reasons, only the legislature was suited to enact such a restriction. Those same reasons are cited in today’s decision reinforce the impression that many of the same societal changes and setbacks experienced in tobacco control are playing out around obesity prevention policy. In Boreali, the Court found that the administrative health agency took economic issues into account by exempting restaurants and bars from smoking bans. Economic concerns are beyond the scope of a health agency’s legal authority. In today’s decision, the fact that NYC exempted convenience stores and bodegas was interpreted as an economic concession (despite the City’s strong arguments to the contrary). In Boreali, the fact that the state legislature had previously rejected smoking bans suggested that it was inappropriate for a health agency to go ahead and do an end-run around a matter previously before the legislature. Likewise, in today’s decision the Court found that the NY City Council has “targeted” sugary beverages in the past, so this subject matter should be off-limits to the Board of Health. In Boreali, the Court ruled that the fact that the health agency was drafting a new type of restriction was evidence that it was “writing on a clean slate” rather than tweaking or otherwise perfecting an existing restriction that was clearly within its purview. Same thing here. It was a new and innovative regulation which, according the this Court’s reasoning, is why it ought to be handled by a legislative body rather than an administrative agency. Finally, the Court in Boreali found that a simple no-smoking rule did not involve expertise in health matters. In today’s decision, too, the Court found that a simple beverage size ban did not require health expertise and, therefore, is beyond the scope of authority granted to the Board of Health. Under today’s ruling, any one of these four factors could invalidate agency action. Such strict application of Boreali may ultimately represent chilling new limits on the powers of health boards in New York state. While analysts may disagree over whether the Court’s decision today was a well-reasoned one, and it may yet be subject to further appellate review, it is important to note that it is basically a dispute about New York law and not a fundamental legal problem with placing limits on serving sizes for sugary beverages that is at issue. But that said, the real disagreement may be more about evolving norms surrounding sugary beverages than about administrative authority. As norms around tobacco use evolved over time, Boreali is increasingly seen as an example of the tobacco industry gaining a temporary victory at the cost delaying the protection of the public’s health. Perhaps today’s decision will be seen in a similar light in the not-too-distant future as norms around sugary beverages continue to evolve. Today the New York City Board of Health approved first-in-the-nation limits on the maximum size of sugary drinks served in restaurants, theaters, and sports venues. The vote was 8-0 in favor of adopting the regulation with one abstention. Grocery and convenience stores are exempt and diet drinks, juices, and drinks that are 50% of more milk (or milk substitute) are excluded. While the measure drew ire from critics throughout the political spectrum, and has been inaccurately characterized as a “ban,” it has succeeded in invigorating the debate on the role of sugary drinks in obesity and the role of government to encourage mindful consumption. Such mindful consumption will begin 6 months from today when the new rule should go into effect. In the meantime, there may be efforts by big drink stakeholders to challenge the regulation. One such group, New Yorkers for Beverage Choices, a group closely aligned if not controlled by the American Beverage Association, has hinted at such a challenge. The pro-business think tank, the Washington Legal Foundation, has published comments on the measure that suggest the basis for a legal challenge. A credible legal challenge could result in the granting of a injunction that could delay or derail the beverage size restriction. However, there appears to be little chance that such a challenge will lead to any measure of success. The Washington Legal Foundation’s primary legal argument to oppose the measure is that it is the type of action that is normally reserved for legislation rather than rule-making by an administrative agency. The problem with that argument is that regulating serving sizes of sugary drinks in food establishments is clearly within the New York City Department of Health and Mental Hygiene’s authority to protect the public’s health under the City Charter’s sec. 558 and to engage in rule-making under sec. 1043. The Washington Legal Foundation public comments cite to a 1980s case, Boreali v. Axlerod. The case involved an early New York non-smoking rule that was overturned primarily because the state’s Public Health Council considered the economic impact of the restriction on businesses and offered waivers for those that could show financial hardship. This went beyond the Public Health Council’s legal authority to issue rules based solely on protecting health. Here, however, there is no waiver process and no consideration by the Board of Health of the economic impact this rule might have on businesses. A second issue raised by the Washington Legal Foundation is that the problem of obesity is an important issue of concern to society and that dealing with such social issues is best left to legislative bodies rather than regulatory agencies. Citing again to the Boreali case, WLF suggests that this is a matter that it should only be addressed by elected officials and not agency appointees. Essentially, they are making a philosophical rather than a legal argument. Legally, this rule-making is very clearly within the agency’s purview. In yesterday’s New York Times, an attorney who has previously represented New York restaurants suggested that the rule could be overturned on Constitutional grounds. This would be a reference to the Commerce Clause (Art. I, Sec. 8, Clause 3 of the U.S. Constitution) which grants Congress the power to regulate commerce among the states. If a state or, as in this case, a political subdivision of a state, passes a law or rule that substantially affects interstate commerce, it is possible that a court would find that the Commerce Clause reserved that power to Congress and the law or rule would be found to be unconstitutional. However, in this instance, there is virtually no argument that could be made that the beverage size rule could affect interstate commerce any more than the cup size could be found to be a form of free speech that the rule unconstitutionally restricts. Neither argument is credible enough to argue in a court room. There is virtually no chance that the rule will be successfully challenged. Either threats of litigation will not materialize or, if they do, will be quickly dismissed. That result will encourage other communities to replicate the courageous action taken in new York City by Mayor Bloomberg and the Board of Health. Soda consumption is a major contributor to adolescent obesity.1 Fortunately, soda consumption has been declining recently,2 presumably as a result of adverse media attention and policy initiatives like the ban on most sugar-sweetened beverages in schools. 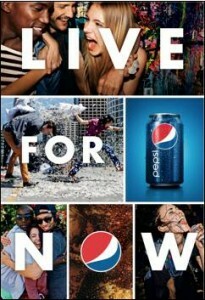 PepsiCo has decided to do something about that, and has designed its “Live for Now” campaign in an effort to reverse the decline in teenage soda consumption. The campaign takes advantage of known adolescent vulnerabilities which result from the facts that the inhibitory structures of their brains are not fully developed, hormonal changes further reduce inhibitions while lowering self-esteem, and their psychosocial development focuses on identity formation and social acceptance.3 As a result they tend to be impulsive, thrill-seeking, and “now”-oriented. While they may rationally balance perceived risks and benefits, doing so does not necessarily inure to their best long-term interests. 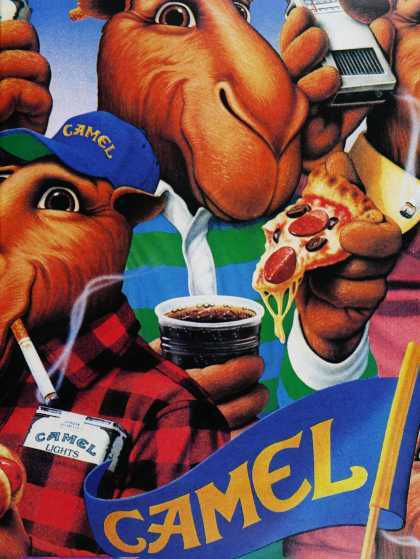 Pepsi’s Live for Now campaign, like the infamous Joe Camel campaign used by R.J. Reynolds, is designed to prey upon these adolescent vulnerabilities in an effort to reverse declining consumption trends as well as to market a particular product. Unlike cigarette advertisers, Pepsi is free to take its campaign to the airwaves. It will do so in a big way when it will sponsor the Superbowl Halftime Show featuring Beyoncé, who recently entered into a $50 million endorsement deal with PepsiCo. The Federal Trade Commission could bring an enforcement action under its unfairness jurisdiction, and state attorneys general and private attorneys could seek injunctive relief under state consumer protection laws. But little is likely to happen unless public outrage is focused on this campaign, and unless regulators and judges learn more about the biological and developmental underpinnings of faulty adolescent decision-making. 1. Ludwig DS, Peterson KE, Gortmaker SL. Relation between consumption of sugar-sweetened drinks and childhood obesity: a prospective, observational analysis. Lancet 2001; 357: 505–508. 2. Strom, S. (2012). “Soda Makers Scramble to Fill Void as Sales Drop.” The New York Times, May 15, 2012. 3. Pechman, Cornelia, Linda Levine, Sandra Loughlin, and Frances Leslie (2005), “Impulsive and Self-Conscious: Adolescents’ Vulnerability to Advertising and Promotion,” Journal of Public Policy & Marketing, 24 (Fall), 202-221. Support for this research was provided, in part, by the National Cancer Institute (2R01CA087571). PHAI senior staff attorney Lissy Friedman and executive director Mark Gottlieb collaborated with Lori Dorfman, Andrew Cheyne and Asiya Wadud of the Berkeley Media Studies Group to produce this article published today in PLoS Medicine. Health advocates need to organize strong public health campaigns to educate the public and policymakers about the dangers of both sugary beverages and the misleading industry corporate social responsibility campaigns that distract from their products’ health risks, according to US experts writing in this week’s PLoS Medicine. In a Policy Forum article, the authors (media and public health experts from the Berkeley and Boston, USA) examined prominent campaigns from industry leaders PepsiCo and Coca-Cola, that, according to the authors, have embraced corporate social responsibility (CSR) with elaborate, expensive, and multinational campaigns. The authors say that while soda companies may not face the level of social stigmatization or regulatory pressure that now confronts Big Tobacco, concern over soda and the obesity epidemic is growing. In response to health concerns about their products, the authors argue that soda companies have launched comprehensive CSR initiatives sooner than did tobacco companies but that these campaigns echo the tobacco industry’s use of CSR as a means to focus responsibility on consumers rather than the corporation, bolster the companies’ and products’ popularity, and to prevent regulation. However, unlike tobacco CSR campaigns, soda company CSR campaigns explicitly target young people and aim to increase sales. Funding: This research was supported by the Healthy Eating Research program (http://www.healthyeatingresearch.org/) of the Robert Wood Johnson Foundation, grant #68240. The funders had no role in study design, data collection and analysis, decision to publish, or preparation of the manuscript. PHAI has produced a FACT SHEET detailing state-by-state electricity costs of traditional cold beverage vending machines. A traditional cold beverage vending machine consumes an estimated 3000 kilowatt hours of electricity per year (kWh/yr). That translates to an average annual energy cost of $313 per machine. Even more energy efficient machines still use between 1200 and 1500 kWh/yr. When multiplied over the total number of machines housed on school property, the electricity cost required to operate cold beverage vending machines amounts to a significant hidden expense for schools that should be subtracted from school beverage vending revenue and taken into consideration when deciding whether or not to renew a beverage vending contract. The Public Health Advocacy Institute is asking the FDA to investigate and take enforcement action against The Coca-Cola Company’s unlawful use of heart health claims on cans of Diet Coke. 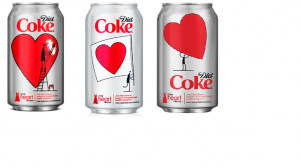 In February of 2010, 2011 and 2012, The Coca-Cola Company has released Diet Coke cans labeled with a large red heart symbol, the National Heart Lung and Blood Institute’s “The Heart Truth” Red Dress logo, and references to women’s heart health. 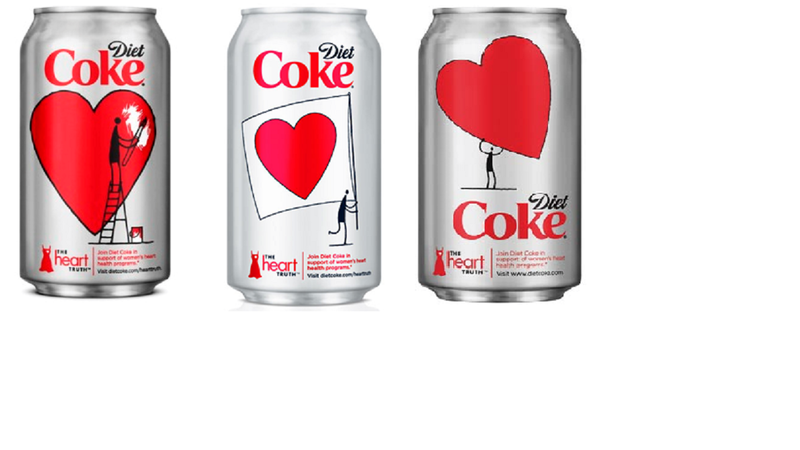 Taken together, the large red heart symbol, the Red Dress logo and references to heart health imply a relationship between consuming a specific food, Diet Coke, and reduced risk for heart disease. The cans pictured below represent the cans in circulation in 2012 (left), 2011 (center) and 2010 (right). The FDA defines health claims to include “any claim made on the label or in labeling of a food…that expressly or by implication, including ‘third party’ references, written statements (e.g., a brand name including a term such as ‘heart’), symbols (e.g., a heart symbol), or vignettes, characterizes the relationship of any substance to a disease or health-related condition.” 21 CFR § 101.14 (a)(1). In its food labeling guidance the FDA states, “ health claims characterize a relationship between a substance (specific food component or a specific food) and a disease (e.g., lung cancer or heart disease) or health-related condition (e.g., high blood pressure), and are supported by scientific evidence (see 21 CFR 101.1472).” FDA, Guidance for Industry: A Food Labeling Guide (April 2008), http://www.fda.gov. 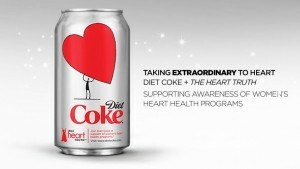 The use of the heart symbol, the phrase “The Heart Truth” and the reference to a national health organization implies that Diet Coke consumption is beneficial to heart health. This claim is not supported by scientific evidence and is not otherwise allowed under FDA regulations. This type of misbranding is especially damaging to the public because it unequivocally links the product to a desired health outcome through multiple uses of the word “heart” and the use of a heart symbol—expressly the type of symbols, third party references and words the FDA references in its regulations and guidance on health claims for the food industry. The FDA should act immediately to investigate The Coca-Cola Company’s unlawful use of this health claim, issue the appropriate warning letter and take enforcement action as necessary. Coca-Cola Unscathed by Happy Meal Changes? 1.3 ounces of french fries are out. Caramel dipping sauce is out. A few apple slices are in. Sugary drinks, however, appear to be fully in the mix if not more so now. The 12 oz. “child’s size” Happy Meal soft drink, ranging from 110-120 calories for the non-diet carbonated options, remains the same. The new chocolate milk option has 170 calories and 25 grams of sugar. To put that into perspective, the container of caramel dipping sauce that will no longer be offered has 70 calories and 9 grams of sugar. As the fountain syrup supplier for McDonald’s, The Coca-Cola Company must be rather pleased that McDonald’s made no overt change to its default drink option for its “most popular” Happy Meal combinations–soda. Chocolate milk may compete with soda, but for parents concerned about calories McDonald’s has managed to position its Coca-Cola brand Happy Meal soda offerings as lower calorie alternatives to the flavored milk. Makes one wonder whether The Coca-Cola Company is whistling “badda ba, ba ba, I’m lovin’ it” in response to McDonald’s Happy Meal menu changes. 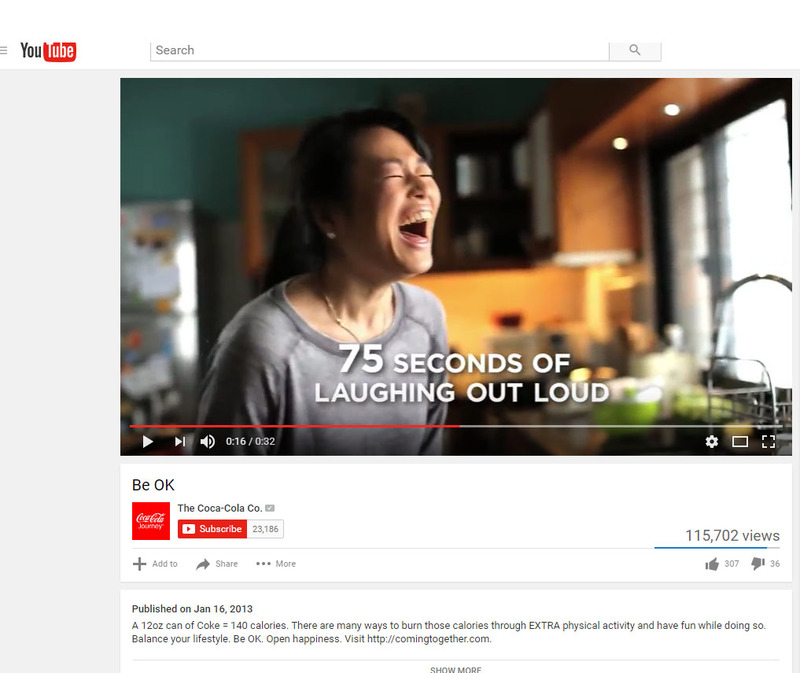 Posted in Feet to the Fire, Uncategorized | Comments Off on Coca-Cola Unscathed by Happy Meal Changes?